Starting from an exposition of some basic notions of the causes and terminology of climate change and a review of the main projections for future climate conditions and the scenarios considered, this article goes on to discuss the causes of and expected trends in extreme events due to climate change, aspects bearing on the frequency of natural disasters brought about by weather conditions. These changes in the level of peril exert a direct effect on the activity of the insurance sector, which will first have to assess the changes in the level of risk that it will have to face and then seek solutions that will enable it to deal with this so as to lessen the damage and increase the resilience of society. The involvement of the insurance sector in this effort is fundamental, and as one of the world’s leading investors it also has a significant role to play in mitigating climate change. Lastly, with respect to the insurance sector in Spain, the article argues that Spain’s arrangements for covering extraordinary risks under the management of the Consorcio de Compensación de Seguros places Spain in a good position to be able to tackle the challenge posed by climate change to society as a whole and the insurance sector in particular. Today it is abundantly clear that the socioeconomic model adopted by most of mankind since the Industrial Revolution, which has been responsible for speedy and unprecedented material wellbeing and population growth, has not been cost-free in environmental terms. Of the many environmental impacts affecting each and every one of the processes and webs making up the biosphere, the impacts resulting from the release of huge amounts of gases into the atmosphere from burning fossil fuels on a mass scale - the basis for that socioeconomic model - are surely likely to have the most widespread, most far-reaching, and longest-lasting effects. Climate, in the form of a statistical distribution of weather patterns, is clearly something that is inherently labile due to a series of external factors that change over time and influence those very weather patterns: solar activity - in practice the sole source of energy inputs to the Earth’s climate system - the Earth’s orbit, the distribution of the continents and the oceans, and ocean currents, volcanic activity, and meteor strikes. However, none of these “natural” factors can account for the recent behaviour of certain climate components, like mean temperature, the way the presence of much higher concentrations of waste gases left over from mankind’s burning of carbon and hydrocarbons in the atmosphere does, and the effect is heightened by deforestation and certain land management and farming practices (Figure 1d). These gases, carbon dioxide (CO2), methane (CH4), and nitrogen dioxide (NO2) in particular, trap part of the heat generated by the incidence of solar radiation on the Earth’s surface as it tries to escape back into space. As a result, part of this radiation is reflected back to the surface, causing mean temperatures to raise, an effect known as global warming. This is the greenhouse effect, and, at its most basic, it is not only a natural process, but one that is essential for life on Earth, because without water vapour, carbon dioxide, and other greenhouse gases in the atmosphere, our planet’s mean temperature would be -18° C, more than 30° C lower than the actual temperature. The rise in the concentration of these gases brought about by human activities is incontrovertibly the reason for the increase in the greenhouse effect and the rise in global mean temperature by 1° C since the beginning of industrialization. Mankind’s influence on the climate system is clear, and the climate changes recorded have already had a broad-ranging impact on human and natural systems. Warming of the atmosphere and the ocean since the mid-twentieth century is unequivocal (Figure 1a). Emissions of CO2 and other greenhouse gases are at their highest levels for at least the last 800,000 years, and this is extremely likely to be the cause of the observed warming (Figure 1c). Changes in the patterns of extreme weather events have been observed since 1950. For example, the frequency of heat waves in Europe has probably increased, it is likely that the intensity of precipitation has increased globally and that in some areas these events have increased the frequency of rises in river levels and flooding, and it is likely that maximum sea levels have been attained since 1970 (Figure 1b), combined with storm surges. Continued emission of greenhouse gases will cause further warming and long-lasting changes in all components of the climate system, increasing the likelihood of serious, pervasive, and irreversible impacts for people and ecosystems. A series of scenarios (technically named representative concentration pathways or RCPs) have been projected based on emission levels (on the basis of population size, development levels, available technology, and environmental behaviour), summarized by four projections: RCP 2.6 assumes stringent mitigation of current emission levels; RCP8.5 assumes very high emission levels - business as usual - and RCP4.5 and RXP6.0 are intermediate scenarios (1). Temperatures are likely to continue to rise throughout the twenty-first century under each of the four scenarios considered, with global increases in 2100 that could range from less than 2° C under RCP2.6 to more than 4.5° C under RCP8.5 (Figure 2a). It is highly likely that heat waves will become more frequent and last longer, that extreme precipitation events (too much and too little) will become more intense and frequent, that the mean sea level will continue to rise, and that the ocean acidification will continue to increase due to the absorption of atmospheric CO2. This will all amplify existing risks and create new ones. All available climate models suggest a difference in behaviour between the first half of the twenty-first century, with a moderate increase in these risks and not very many differences among the various scenarios considered, and the second half of the twenty-first century, by the end of which many of these impacts may be extremely serious and at the same time considerably different, depending on the scenario considered. Figure 1: a) Annually and globally averaged combined land and ocean surface temperature anomalies. Different colours indicate different data sets. b) Annually and globally averaged sea level change relative to the average over the period 1986 to 2005 in the longest-running data set. c) Atmospheric concentrations of the main greenhouse gases: carbon dioxide (CO2, green), methane (CH4, orange), and nitrogen dioxide (NO2, red) determined from ice core data (dots) and from direct atmospheric measurements (lines). d) Global anthropogenic CO2 emissions from forestry and other land use as well as from burning fossil fuels, cement production, and agricultural burning. (Source: IPCC, 2014). Figure 2. 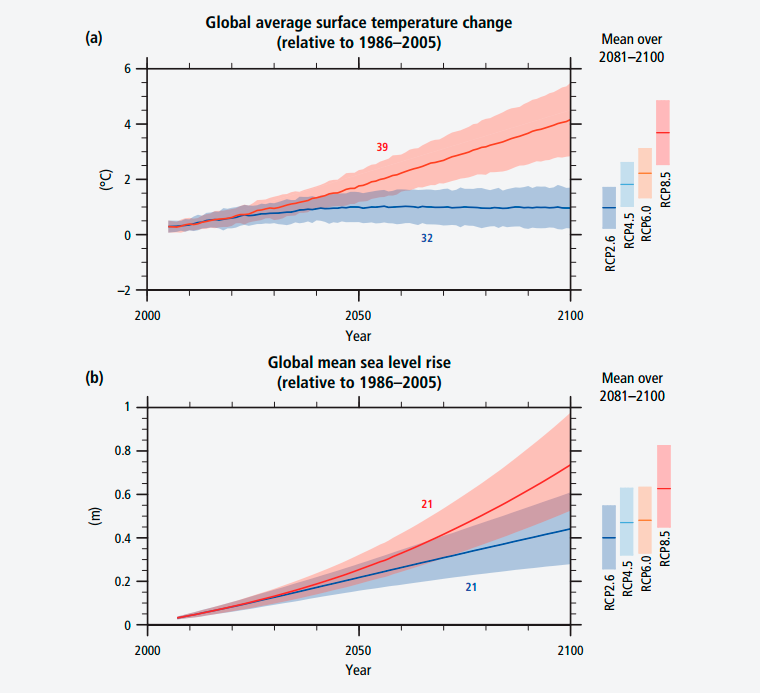 Anticipated global average surface temperature change (a) and global mean sea level rise (b) according to the different scenarios considered. At right, the mean average uncertainties. (Source: IPCC, 2014). In 2015 Spain’s National Weather Service, the Agencia Estatal de Meteorología (AEMET), published regional climate scenarios for Spain over the course of the twenty-first century (AEMET, 2015). The projections agree with the global forecasts published in the IPCC’s fifth report that the changes under the various scenarios will not be too different until 2040-2050, after which significant differences will be observed up to the year 2100. It is to be noted that AEMET considered only the RCP4.5, RCP6.0, and RCP8.5 scenarios, regarded as the most realistic. An increase in average high temperatures of between 2.5º C (RCP4.5) and 5.5° C (RCP8.5). An increase in heat wave duration of from 5-10 days (RCP4.5, RCP6.0) to more than 25 days (RCP8.5). An increase in the number of hot days (2) of from 15-20 % (RCP4.5) to more than 50 % (RCP8.5). An increase in average low temperatures of between 2° C (RCP4.5) and around 4.5° C (RCP8.5). A decrease in the number of frost days of between 15 % (RCP4.5) and 25 % (RCP8.5). An increase in the number of warm nights (3) of between 22 % (RCP4.5) and over 50 % (RCP8.5). No appreciable differences among the scenarios for precipitation levels, with a projected decrease of around 5 % in total annual precipitation; a decrease of around 3 % in the number of intense precipitation events; an increase of around 2 % in dry spell duration; and a decrease of around 4 % in the number of rainy days. In other words, the most significant forecast for mainland Spain and the Balearic Islands is a rise in temperature, which, in the worst-case scenario considered, could be quite sizeable by the end of the twenty-first century. The projections for precipitation are subject to greater uncertainty, but the temperature increase would bring with it a large increase in evapotranspiration, which, combined with the likely decrease in precipitation, could unquestionably exert a major impact on available water resources. An increase in the average high temperatures of between 1° C (RCP4.5 and RCP6.0) and 2.5° C (RCP8.5). An increase in heat wave duration of between some 15 days (RCP4.5) and over 70 days (RCP8.5). An increase in the number of hot days of between 25 % (RCP4.5) and more than 70 % (RCP8.5). An increase in the average low temperatures of between 1.5° C or 2° C (RCP4.5 and RCP6.0) and around 3º C (RCP8.5). An increase in the number of warm nights of between 45 % (RCP4.5) and nearly 80 % (RCP8.5). There were differences among the scenarios considered with regard to precipitation in the Canary Islands. A decrease in total annual precipitation of between 10 % (RCP4.5) and 25 % (RCP8.5); no change in heavy precipitation according to RCP4.5 but a decrease of around 5 % according to RCP8.5; an increase in dry spell duration of between 5 % (RCP4.5) and 20 % (RCP8.5); and a decrease in the number of rainy days of between 5 % (RCP4.5) and 10 % (RCP8.5). To this point we have mainly been discussing trends in mean values, but to be able to ascertain how climate change is likely to affect extreme values, of greatest interest to the insurance sector, a different approach is needed. First of all, greater knowledge of the attribution of current impacts to climate change is needed (NAS, 2016). That is to say, we need to be able to answer the question of to what extent an individual event is caused by, or its strength is augmented by, climate change. This is an issue of high priority and of great interest to the scientific community. To this end, at least from a theoretical standpoint, climate models should be able to estimate the likelihood that a given event would occur in an atmosphere like today’s, with the changes in composition brought about by humans (p1), and the likelihood that that same event would occur in an atmosphere without any anthropogenic changes (p0). Thus, attribution may be expressed as a function of the fraction of attributable risk (FAR), i.e., FAR = (p1-p0)/p1, or the relative risk (RR), RR = p1/p0. These estimates will naturally depend on the ability of the models employed to reproduce the conditions in which a given event occurs, and this causes the reliability of the attributions to vary greatly from one type of event to another. Generally speaking, the confidence (3) level of results for the attribution of anthropogenic influences on climate is highest for extreme events related to temperature. Confidence in the attribution of precipitation-related events tends to be lower, because modelling of atmospheric water vapour is much more complex. In addition, while conceptually a warmer world should produce more evaporation and a warmer atmosphere can hold larger amounts of water vapour (5), which might suggest a global increase in precipitation and greater precipitation intensity, in practice the changes in atmospheric circulation and convective processes (6) that regulate precipitation are extremely complex. Consequently, there is quite a bit of uncertainty and much discrepancy surrounding the influence of climate change on precipitation. Briefly stated, the level of confidence in attributing external events to climate change decreases in the following order: heat waves, cold waves, droughts, and heavy precipitation. There is still considerable uncertainty in attributing specific episodes of severe convective storms and extratropical cyclones to climate change. By way of example, the difficulties and limitations notwithstanding, certain attribution studies have indicated that recent higher activity of winter storm systems that have caused major storm surges along the Atlantic coast of Europe - 2013 and 2014 being the most active years in this respect since 1948 - may be a consequence of climate change (Masselink et al., 2016) and that the damage caused by hurricane Sandy in New York in 2012 was 30 % higher solely as a result of the rise in sea level recorded since 1950 (Lloyd’s, 2014). According to the “The Global Risks Report” (World Economic Forum, 2016), in terms of impact the failure of climate change mitigation and adaptation is the main global risk today. In terms of likelihood, extreme weather events are the second most important global risk, the failure of climate change mitigation and adaptation the third, and large-scale natural disasters the fifth. Thus, in view of the interest attaching to this question, there have been a number of studies looking at how climate change may impact extreme weather events and hence natural hydrometeorological perils. The “Managing the Risks of Extreme Events and Disasters to Advance Climate Change Adaptation” report (IPCC, 2012) reviews the state of scientific knowledge on the subject. The report notes the increase in the frequency and duration of heat waves all across Europe as one of the main changes to be expected, particularly important in urban heat islands. It likewise notes that semiarid regions will suffer a higher incidence of drought and a much greater risk of wildfires. These more adverse conditions for natural vegetation could indirectly cause an increase in the risk of landslides on sloping ground. The effects of coastal flooding will be more serious as a result of the increase in mean sea level, with more frequent damage to infrastructure and property and the loss of agricultural land to soil salinization. There is less consensus concerning predictions of more or less heavy storm activity and hence of the effects of high winds. While the scenarios appear to indicate a northward shift in the westerly wind belt and hence a relative decrease in the risks of episodes of high winds and flooding caused by large-scale events (7) in Southern Europe, conversely the frequency and intensity of smaller-scale events (8) could increase as a result of atmospheric convection. In line with the above, using the latest models and the data available to the IPCC’s Fifth Report, a recent study by the European Commission`s Joint Research Centre (Alfieri et al., 2015) performed a flooding risk projection for Europe in the twenty-first century for the most pessimistic scenario (RCP8.5) and a range of socioeconomic scenarios, mapping the risk projection onto the affected population and estimating the economic damage. Under that scenario, flooding peril in Europe at the end of the twenty-first century would increase by 220 % on average, affecting around half a million people in 2050 and nearly a million people in 2080 (compared with 216,000 people/year at the present time) and would cause damage in the range of between EUR 20 and 40 billion in 2050 and EUR 30 and 100 billion per year in 2080 (compared with EUR 5.3 billion/year at the present time). Plainly, studies along these lines will hold out growing interest. In view of the economic repercussions - generally and for the insurance sector in particular - of a climate that is poised to become more extreme, in both frequency and intensity, more and more studies like this are being carried out in an effort to translate the physical impacts produced by climate modelling into economic costs. Another article in this same number of the Consorseguros Digital magazine cites two other studies assessing the economic impact of climate change in Europe (Ciscar et al., 2014) and throughout the world (OECD, 2015). These studies have published economic valuations of the impacts projected according to different scenarios and time horizons by sector and geographical region or sub-region. Other studies have been even more specific. For instance, the Caisse Centrale de Réassurance [Central Reinsurance Fund], a public agency tasked with reinsuring natural disasters in France, has recently produced a modelling-based study of costs forecast by the agency in 2050 for three of the main weather perils likely to be affected by climate change (CCR, 2015). The principal author, David Moncoulon, has contributed a detailed consideration of the study, set out in another article published in this volume. 2. The insurance sector and climate change. Its role in adaptation and mitigation. There is an extensive literature as to how climate change may affect the insurance sector and how transferring the risks ensuing from climate change may be one of the most effective means of mitigation (9) and adaptation (10). In recent decades there have been increases in direct losses and insured losses due to meteorological (11), hydrological (12), and climatological (13) events (Munich Re, 2016; CRED-UNISDR, 2015). Nevertheless, despite prima facie attribution of specific events to climate change as discussed above, there is general consensus that the primary reason for this increase in losses is not an increase in perils but an increase in exposure as a result of economic growth and higher concentration of population and property in vulnerable areas. The increase in insured losses is also due to greater penetration by natural disaster insurance, although globally the underinsurance gap continues to be on the order of 70 %. In other words, of the average of USD 180 billion a year in damage caused by natural disasters all over the world, a yearly average of USD 127 billion is not covered by insurance (Swiss Re, 2015). Insurance coverage varies greatly among regions - it is appreciably higher in developed markets than in emerging markets - and among types of perils - being more frequent for the most common events, e.g., weather and climate events than for less common ones, e.g., geological events. The IPCC’s fifth report, especially the report of its working group II on impacts, adaptation, and vulnerability (Arent et al., 2014), points out that climate change may have a major impact on the insurance sector. The expected large increase in losses due to weather events could potentially threaten the solvency of insurance entities if they are unable to adjust their risk management or if higher premiums lead to a reduction in insurance to the point where it is no longer viable. The report lists a series of possible products and systems that might be able to respond to changing meteorological and climatological perils, on the assumption that an increase in capital may be needed to cover losses. It is noted that risk-based premiums could, in principle, be an incentive to decrease vulnerability on the part of the insured. The reinsurance market may be key to supplying capital. Its global range of action provides scope for diversifying regional risks. The fact that natural perils do not correlate with capital market risks means that this could be a potentially attractive field for institutional investors, for instance, in the form of catastrophe bonds. Regulatory frameworks like Solvency II will help enhance the sector’s resilience in the face of natural disasters. The IPCC has also emphasized the importance of issues relating to governance, public and private associations, and insurance market regulation as strategies for better adaptation to climate change. In this connection it has underlined that, theoretically, solutions insuring individual risk are preferred, even though the component that cannot be diversified (the part that may increase with climate change) may be public. It puts forward as examples countries that have public-private arrangements or compulsory public systems for coverage of what in Spain are referred to as “extraordinary risks”. In particular, “Systems with government intervention range from ex ante risk financing design, such as public monopoly natural hazard insurance (e.g., Switzerland, with inter-cantonal pool), or compulsory forms of coverage to maximize the pool of insureds (e.g., Spain, France, with unlimited state guarantee on top), to ex post financing design, such as taxation-based governmental relief funds (e.g., Austria, Netherlands). In between these boundaries rank predominantly private insurance markets, in several countries combined with governmental post-disaster ad hoc relief (e.g., Germany, Italy, UK, Poland, USA)”. However, the report points out that governmental post-disaster aid is a disincentive to insurance. The report notes that regulation of the insurance market ensures availability, affordability, and solvency but often takes only short- to medium-term approaches. Because of climate change, the role of regulators has changed to include risk-adequate pricing, as well as such aspects as risk education and risk-reduction in the long term. How these issues are addressed will undoubtedly depend on the situations, markets, and countries concerned. Many discussions have already accepted that there is no single solution to risk financing in this sector (Surminski et al., 2015). However, it will definitely be necessary to seek insurance solutions that are at one and the same time resilient, economically sustainable, affordable, and responsive to aspects relating to the sharing of responsibility between the public and private sectors, direct participation by the public sector as may be needed, compulsory disaster insurance, or product bundling to cover a range of risks (European Commission, 2013). Physical risks. First-order risks which arise directly from weather and climate-related events, such as floods and all the others mentioned previously. They comprise impacts resulting from such events, e.g., damage to property, and also those that may arise indirectly from them, such as disruption of global supply chains or resource scarcity. Transition risks. Financial risks which could arise for insurance firms from the transition to a lower-carbon economy. For insurance firms, this risk factor is mainly about the potential re-pricing of carbon-intensive financial assets and the speed at which any such re-pricing might take place. To a lesser extent, insurers may also need to adjust to potential impacts resulting from reductions in insurance premiums in carbon-intensive sectors. Liability risks. Risks that could arise for insurance firms as a result of claims by parties who have suffered loss and damage from climate change and then seek to recover losses from others who they believe may have been responsible. Where such claims are successful, those parties against whom the claims are made may seek to pass on some or all of the cost to insurance firms under third-party civil liability contracts such as professional indemnity or directors’ and officers’ insurance. Indirectly, management of transition risks could be an opportunity for the insurance sector to play a leading role in mitigating climate change. In all, the sector has an investment portfolio valued at USD 28 trillion under management (OECD-The Geneva Association, 2016). A portion of these investments are in economic sectors that generate large quantities of greenhouse gases. With this in mind, if a global investor having the clout of insurance companies were to gradually divest their holdings in carbon-intensive industries and instead steer their investments towards low-carbon infrastructure, technologies, and industries (renewable energy projects, energy efficiency enhancement projects, etc. ), not only would it be setting a clear example of its engagement with climate risk (The Geneva Association, 2014), doing so would also have a real and significant impact on mitigating emissions. Furthermore, the insurance sector itself has underlined its important role as a means for adapting to climate change, either directly by spreading risk or by its comprehensive records of damage caused by natural disasters as a source of essential information for studies to enhance our understanding of natural risks and the changes that can be expected to occur with climate change (The Geneva Association, 2009, 2013). Concomitantly, thought is being given to solutions aimed at being able to properly assess risk, so that the effects of climate change will continue to be insurable. In this regard, use of a set of probabilistic models incorporating clearly defined, deterministic scenarios so as to properly simulate a wide range of future possibilities has been suggested. This set of models should have a solid scientific footing and should be able to set an upper limit for the worst-case scenario considered. The Tail Value at Risk (TVaR) needs to be known to be able to set aside an appropriate capital allocation and suitably diversify risks. According to this source, risk mitigation depends in part on the insured parties themselves and plays a key role in keeping insurance affordable, hence the importance of good educational and awareness policies. The close of 2015 brought the world as a whole good news regarding climate change. The 21st Conference of the Parties to the United Nations Framework Convention on Climate Change (COP21) culminated in the Paris Agreement (UNFCCC, 2015). This Agreement is exceptionally important and is described in depth in another article in this volume by the Spanish Climate Change Office [Oficina Española de Cambio Climático], which took part in the negotiations. This is the first time all the countries in the world have agreed to concerted action against climate change and have devised a strategy enabling all countries and all sectors, including the insurance sector as regards “loss and damage”, to accept commitments and play a role in transitioning to a more sustainable socioeconomic model less dependent on fossil fuels and in adapting to future climatic conditions. More specifically, strategies for mitigating climate change are aimed at keeping warming to below the threshold of a mean global temperature increase of 2° C, considered by experts to be the “safe” threshold that will still hold out the possibility of escaping the most serious consequences at the end of this century, although unfortunately this will not prevent some regions and sectors from being quite adversely affected. The insurance sector should also put forward adaptive measures especially designed for the most vulnerable populations that are being and will be impacted the most by the effects of climate change. A good many of these measures will need to be institutional, with coordination between the sector, the various developmental aid organizations, governments and international institutions, and peoples; to include economic options like financial incentives, insurance, catastrophe bonds or payments for ecosystem services; and to involve legislation, such as laws aimed at helping to achieve disaster risk reduction and insurance coverage for the population, and national policies intended to plan and prepare for disaster risks. Spain has in place a scheme to cover extraordinary risks, established by law and managed by the Consorcio de Compensación de Seguros (CCS), a state-owned enterprise whose operation has as an essential feature its reliance on participation by the private insurance sector. A basic attribute of the system for covering extraordinary risks is that insurance policies covering property (14) damage (subject to certain exceptions) and personal life and accident coverage taken out with the insurance company of the insured’s choice also provide the insured with compulsory coverage against risks regarded as exceptional. This means that dual coverage, coverage of ordinary risks provided by the insurer, and coverage of extraordinary risks handled by the CCS, is afforded under one and the same policy. Policy holders pay a surcharge on the amounts insured for this additional coverage, and the surcharge is collected by the insurance company along with the policy premiums. Accordingly, the CCS acts as a direct insurer in cases of losses caused by natural disasters such as those caused by weather events: river and coastal flooding, winds higher than 120 km/h, and tornadoes (15). If one of these perils occurs, the CCS indemnifies policy holders for the damage sustained in the same terms as the original policy, with a deductible for businesses, industry, and companies, but not for individuals. Besides weather catastrophes, the CCS also covers geological perils (earthquake, tidal waves, and volcanic eruptions), meteor strikes, and human perils (terrorist acts, rebellions, insurrection, mutiny, and civil unrest and actions by the armed forces and the police in times of peace). This risk diversification-based coverage operates on the principle of compensation among the risks. For this reason the surcharge is not set according to the degree of exposure to a given risk but is instead calculated on the basis of achieving an overall technical balance for all the risks covered under the scheme, setting a rate for each property type that is the same for all insured parties and for everywhere within the national territory, without distinction. The amount of the surcharge thus depends on the type of property covered and the capital insured under the policy. By being compulsory, the insured collective extends to over 50 million life and accident insurance policies and to over 45 million property insurance policies (CCS, 2015), and the large insurance pool makes possible very broad coverage at a cost that is highly affordable to the insured. The scheme is self-sustaining and does not require budgetary appropriations from any government body. More than EUR 6.4 billion in compensation (adjusted to 2014 euros) was paid out between 1987 and 2014, 93 % for natural disasters (CCS, 2015). In all, 91 % of the indemnities paid out for natural disasters were for weather events (74 % for river or coastal flooding and 17 % for high winds). Some covers have been improved and expanded over time. For instance, for indemnities for damage caused by high winds, the rather complicated initial definition of atypical cyclonic storm, the only cause accepted at first, evolved to damage produced by winds in excess of 135 km/h in 2009, and in 2011 the threshold was lowered to 120 km/h. To date the scheme has proven capable of handling the various losses, some of which have been particularly heavy and costly, even though the number of claim applications grew fivefold from 1981 to 2014 (from a yearly average of 10,000 to 50,000), and the average yearly cost of compensation (at constant prices) has risen from around EUR 150 million to more than EUR 250 million. Nevertheless, it should be noted that over that same period the number of policies with CCS coverage grew by a factor greater than five, both for property insurance coverage and life and accident insurance coverage. Putting all these factors together, the average amount of compensation per claim paid out by the CCS (at constant prices) for weather-related causes has fallen by about a third over the same period. One possible conclusion from this decrease is that the existence of a compulsory broad-based insurance coverage scheme rooted in public-private cooperation has not acted as a disincentive preventing risk reduction measures from being taken. Indeed, insurance, in association with appropriate early warning, emergency response, and land management measures has contributed to integral weather peril management that has helped increase society’s resilience to those perils. The system of coverage for extraordinary risks has been constantly evolving over its 75-year history. This evolution has gone hand in hand with that of the insurance sector in Spain and indeed with that of Spain’s own society and economy, and the scheme has been operated in the environment of a climate like Spain’s, especially complex and diverse. The CCS operates in a territory in which the average annual precipitation ranges from over 2,600 mm to around 100 mm. Similarly, as a consequence of the country’s complicated set of geographical features, the temperature range is just as diverse, both the mean values and the extreme values. To conclude, the Iberian Peninsula’s position on the border between the temperate zone, with its western circulation, and the subtropical zone, between the Atlantic Ocean, an inner sea like the Mediterranean Sea, and North Africa imparts enormous complexity to this climate variability. The Iberian Peninsula and Balearic Islands alone have 13 climate types under the Köppen classification (AEMET-IM, 2011). By comparison, other countries in our region, like the United Kingdom, have only two or three. Add a subtropical African archipelago like the Canary Islands brings still greater variation to the geographical territory under the jurisdiction of the CCS. As previously discussed, climate change is certainly likely to alter the distribution of this climatic variability and may even reduce it, but the arrangement used to cover extraordinary risks has been well proven in these variable and highly different conditions and has afforded a workable solution. The scheme’s ability to adapt, its flexibility, is another of its strong points. The system has changed over time, with the concomitant legal changes, to meet the needs of Spain’s insurance market, tackling the challenges posed by improvements in coverage: new perils (wind), new branches (lost profits, life), and so forth. Along these lines, if the level of risk were to change because of climate change, making it necessary to deal with the increased risk, the system is ready and capable of making the corresponding adjustments in the coverage (modifying thresholds, adding new perils, adjusting surcharges), thanks to ongoing dialogue and cooperation between the private sector and the CCS, the entity tasked with managing extraordinary risks. Summing up, through its extraordinary risk insurance scheme, Spain’s insurance sector already has in place suitable arrangements for dealing with the possible increase in risk that could ensue from climate change. The CCS works together with a number of national and international partners to publicize the role of disaster insurance, spread knowledge of the causes of natural perils, help with analysing future losses produced by, inter alia, climate change, and make people in general aware of their level of risk so that they can take steps to protect themselves. AEMET-IM (2011) Atlas Climático Ibérico. Agencia Estatal de Meteorología e Instituto de Meteorología de Portugal, Madrid, 79 pp. Arent D.J., R.S.J. Tol, E. Faust, J.P. Hella, S. Kumar, K.M. Strzepek, F.L. Tóth, y D. Yan (2014) Key economic sectors and services. In: Climate Change 2014: Impacts, Adaptation, and Vulnerability. Part A: Global and Sectoral Aspects. Contribution of Working Group II to the Fifth Assessment Report of the Intergovernmental Panel on Climate Change [Field, C.B., V.R. Barros, D.J. Dokken, K.J. Mach, M.D. Mastrandrea, T.E. Bilir, M. Chatterjee, K.L. Ebi, Y.O. Estrada, R.C. Genova, B. Girma, E.S. Kissel, A.N. Levy, S. MacCracken, P.R. Mastrandrea, y L.L. White (eds.)]. Cambridge University Press, Cambridge, United Kingdom and New York, NY, USA, pp. 659-708. Alfieri L., L. Feyen, F. Dottori y A. Bianchi (2015) Ensemble flood risk assessment in Europe under high end climate scenarios. Global Environmental Change, 35, pp. 199-212. CRED-UNISDR (2015) The human cost of weather-related disasters 1995-2015. Centre for Research on the Epidemiology of Disasters –CRED-, Brussels, Belgium and United Nations Office for Disaster Risk Reduction –UNISDR-, Geneva, Switzerland. 27 pp. CCR (2015) Modélisation de l’impact du changement climatique sur les dommages assurés dans le cadre du régime Catastrophes Naturelles. Service R&D modélisation, Département des Études Techniques, Direction des réassurances publiques, Caisse Centrale de Réassurance. Paris, France, 28 pp. CCS (2015) Estadística de riesgos extraordinarios. Serie 1971-2014. Consorcio de Compensación de Seguros, Madrid, 143 pp. Ciscar J.C., L. Feyen, A. Soria, C. Lavalle, F. Raes, M. Perry, F. Nemry, H. Demirel, M. Rozsai, A. Dosio, M. Donatelli, A. Srivastava, D. Fumagalli, S. Niemeyer, S. Shrestha, P. Ciaian, M. Himics, B. Van Doorslaer, S. Barrios, N. Ibáñez, G. Forzieri, R. Rojas, A. Bianchi, P. Dowling, A. Camia, G. Libertà, J. San Miguel, D. de Rigo, G. Caudullo, J.I. Barredo, D. Paci J., Pycroft, B. Saveyn, D. Van Regemorter, T. Revesz, T. Vandyck, Z. Vrontisi, C. Baranzelli, I. Vandecasteele, F. Batista e Silva, D. Ibarreta (2014) Climate Impacts in Europe. The JRC PESETA II Project. JRC Scientific and Policy Reports, EUR 26586EN, 151 pp. Geneva Association, The (2009) The Geneva Papers on risk and insurance: Issues and practice. Special Issue on Climate Change and Insurance. Vol. 34 No. 3, pp. 319-505. Geneva Association, The (2013) Warming of the Oceans and Implications for the (Re)insurance Industry. A Geneva Association Report, Geneva, Switzerland, 32 pp. IPCC (2012) Managing the risks of extreme events and disaster to advance climate change adaptation: summary for policymakers. Invergovernmental Panel on Climate Change, Geneva, Switzerland, 21 pp. 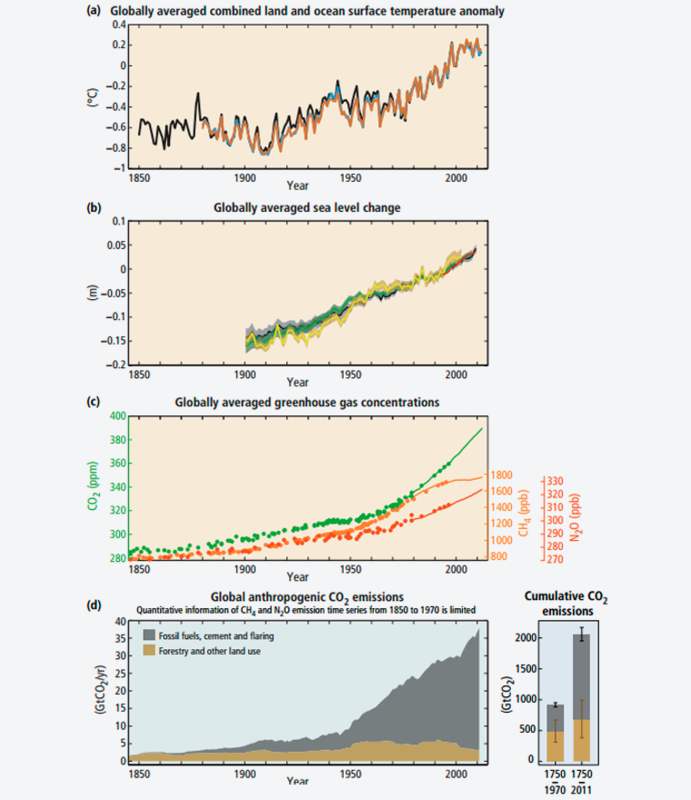 IPCC (2014) Climate Change 2014: Synthesis Report. Contribution of Working Groups I, II and III to the Fifth Assessment Report of the Intergovernmental Panel on Climate Change [Core Writing Team, R.K. Pachauri and L.A. Meyer (eds.)]. IPCC, Geneva, Switzerland, 151 pp. Masselink G., B. Castelle, T. Scott, G. Dodet, S. Suanez, D. Jackson, F. Floc’h (2016) Extreme wave activity during 2013/2014 winter and morphological impacts along the Atlantic coast of Europe. Geophysical Research Letters, 43, doi:10.1002/2015GL067492. Munich Re (2016) Topics Geo 2015: Natural catastrophes 2015. Analyses, assessments, positions. Münchener Rücksversicherungs-Gesellschafft, Munich, Germany, 76 pp. NAS (2016) Attribution of Extreme Weather Events in the Context of Climate Change. National Academies of Sciences, Engineering and Medicine, Washington D.C., USA, 145 pp. OECD (2015) The Economic Consequences of Climate Change, OECD Publishing, Paris, France, 137 pp. OECD – The Geneva Association (2016) Special Session on Climate Change and the Insurance Sector: Conference Review. Paris, 3 December 2015. OECD, Paris, France and The Geneva Association, Geneva, Switzerland, 26 pp. PRA (2015) The impact of climate change on the UK insurance sector: A Climate Change Adaptation Report by the Prudential Regulation Authority. Bank of England, Prudential Regulation Authority, London, September 2015, 85 pp. Reflections on the Current Debate on How to Link Flood Insurance and Disaster Risk Reduction in the European Union. Nota di Lavoro 41.2014, Fondazione Eni Enrico Mattei, Milan, Italy, 34 pp. Swiss Re (2015) Underinsurance of property risks: closing the gap. Sigma nº-5/2015. Swiss Reinsurance Company, Zurich, Switzerland, 39 pp. World Economic Forum (2016) The Global Risks Report 2016, 11th Edition. The Global Competitiveness and Risks Team, World Economic Forum, Cologny, Geneva, Switzerland. 97 pp. The effects of warming are not limited just to an increase in the mean temperature; rather, the variation in the chemical composition of the atmosphere also entails a multitude of impacts on other climate system components, namely, precipitation and the precipitation pattern, atmospheric circulation, the frequency and strength of extreme weather events, and indeed all the ecological and economic systems that are affected by or depend on these. © 2018 CONSORCIO DE COMPENSACIÓN DE SEGUROS.